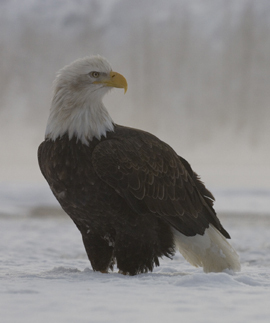 Fleeing the frigid interior of Alaska and Canada, bald eagles assemble along the Chilkat River to feed on salmon. ...a picture little changed through millennium. Everywhere I look there are hundreds of bald eagles (Haliaeetus leucocephalus). Dozens are feeding along the river, and hundreds more are perched in the tall cottonwoods (Populus species) along the bottoms. An immature bald eagle hauls a spawned out chum salmon from the Chilkat River. The chums averaging 8-17 pounds weigh as much as the eagles do. The Tlingit Indians have long witnessed the annual assemblage of eagles at this very place, a place of bounty, of beauty and power known as the Council Grounds. Where to point my telephoto lens is the biggest challenge. Pop! Crack! Wings, big wings slap together. 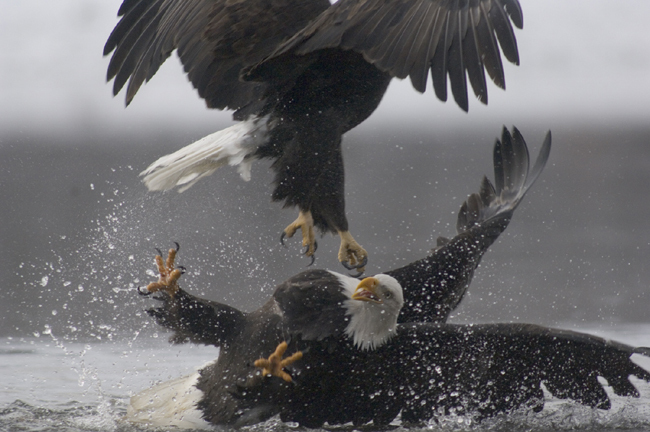 I turn to see two adult bald eagles collide. Swinging my big telephoto around, I instinctively floor the shutter and another big batch of bald eagle pixels out of the oven. An eagle flies off with a salmon head to feed in seclusion. But just as likely though, it will become the target of aggressive eagles who feed by stealing. In flight these clumsy feet are precision guided weapons. 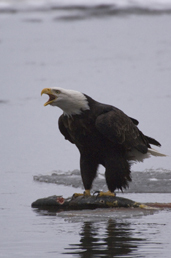 Faces with incoming talons, a feeding eagle has little choice but to relinquish its fish. Aggressive females seem to prefer to steal rather than muscle a big chum out of the river. The eagle has landed on the gravel banks of the Chilkat River and is approaching a picked over chum salmon. Cautious gulls and ravens don't miss their share. Ice-free waters and a late season run of chum salmon(Oncorhynchus keta) along the Chilkat River in southeast Alaska attract bald eagles from all over Alaska, the Yukon and British Columbia as well as photographers, like me, from all over the world. I've come late in the season. Cold spilling out of the Yukon is sealing the last of the salmon under clear ice. This means I have the river and the eagles to myself at the ancient Council Grounds.